Experienced filmmakers know that storyboarding is absolutely essential when it comes to planning and executing production on an amazing film. Storyboarding also helps creatives develop blueprints for elearning (courses delivered completely online). Additional projects such as DVD interfaces, mobile app prototyping and game development. Note: this post has been updated. 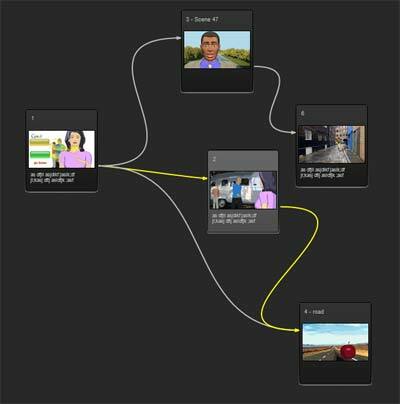 New version of StoryBoard Artist is out with advanced support for elearning storyboards. With features like Object Linking in the StoryBoard Artist and StoryBoard Artist STUDIO producers of multimedia and elearning projects can layout their project from start to finish and interact with the content in the preproduction phase. See all linked objects in your project. Object Linking feature allows for you to build links into the storyboards so you can map out what happened when users choose specific options. The program plays back your storyboards, then, when there is a linked object or a decision to be made by the user – for instance which DVD extra they would like to watch – the storyboards pause and wait for the viewer to actually make a choice. Then, using the non-linear functions of StoryBoard Artist, will jump ahead or back in time depending on what is necessary. In an example, sent to us by a user using “Lee Daniels’ The Butler” as a sample, you can play the storyboards and click the object links to see the entire project. All of the links and options created in the program are saved upon export, so prototypes can be given to clients and developers to not just be viewed, but also interacted with. Object Linking is just one feature among many that makes StoryBoard Artist the most versatile digital storyboarding tool available. No matter what kind of project you are working on, storyboards help create a better end project. For more information on StoryBoard Artist, visit the PowerProduction Website. If you have questions, simply Chat With Us!